The Jemini Cantilever Desks provides entry level traditional style furniture suitable for use in multiple office environments. The range has 25mm thick tops and comes in 3 ?nishes with silver cantilever frames. Complemented by a full range of pedestals, storage and tables. Jemini Radial Workstation - Provides easy working access to a PC as well as ample desktop space. Fixed pedestals can be added to the 800mm deep end. Modesty panels included as standard. Radial desks can be positioned together to create various con?gurations. 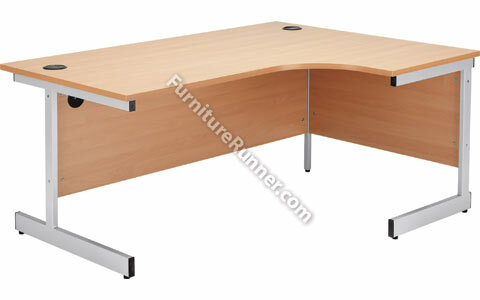 Desk high pedestals can be added to either end. Dual cable management ports. Dimensions: W (Select Below) x D600/800 x H730mm.